Did you notice? I’ve been on a sock break lately. 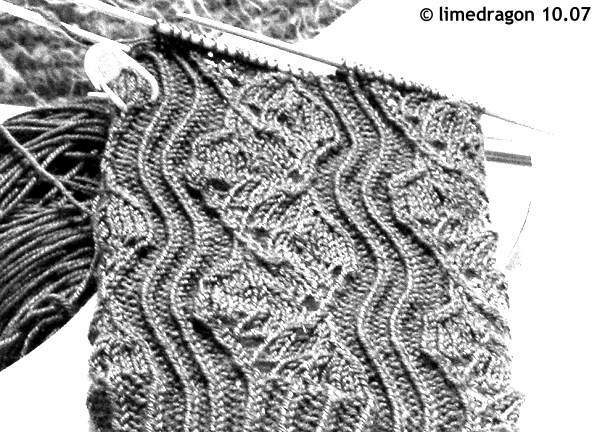 In late August or early September, I suddenly wanted to knit something different. 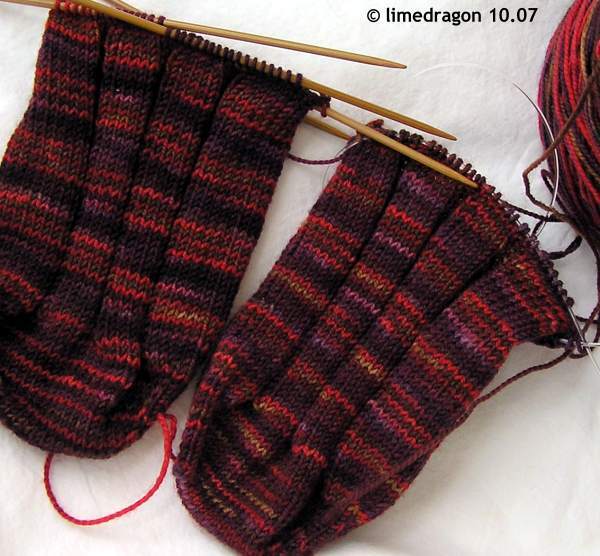 But I didn’t go cold turkey; I’ve been stealthily working on a sock design for my Hogwarts SS2 pal, Amelia. It’s been a slow process. It took me a while to get a chart draft worked out to my satisfaction, and then even longer to knit it and see what worked�or didn’t. Finally, I think I have gotten it sorted out. Meanwhile, while trying to boost my socknitting mojo, I signed up for Socks in the Cities KAL, and volunteered to be a Sockapalooooza Savior. After a few false starts, I decided to knit the newest Sockamania Club KAL pattern for my pal. The colorway I’m using is “The Berry Brigade” from Spunky Eclectic. The purplish tinge has, thus far, been impossible for me to capture in a photo, but I’m loving the red. Okay, #1, that is a great post title. The socks look very intricate and fabulous! Alas, no names come to mind. Shouldn’t it be HP based? It looks like ghosts on the socks to me. The wigglies and wavies. Hmmm….the socks are beautiful, but no name ideas. Sorry. Wow, that b&w shot is georgeous! DS really likes the lightning thief series… his friend has the first so I haven’t read it yet. Those are cool socks, but we sure aren’t coming up with much… Maybe you could give us a hint.